If you have already installed and tested eclipse, skip to step 10. Go to the eclipse [http://www.eclipse.org/downloads/ | downloads page]] and download the latest version of Eclipse (choose 'Eclipse IDE for Java Developers') to the desktop. Eclipse will ask for a workspace location (accept the default location or choose one of your own that is memorable). If the welcome screen pops up, close it. Run your application: Run -> Run-As -> Java Application. You should see your output text appear in the console window. Leave all defaults, click 'Finish'. Next we need to copy the Processing classes (core.jar) into our project. The location of this file will vary depending on where you installed Processing, but on Windows it might be C:\Program Files\Processing1.x\lib\core.jar. On a Mac, Processing will usually be in /Applications/Processing1.x, but to view the contents of this directory you must first right-click and choose 'Show Package Contents', then navigate down (via the to Contents/Resources/Java/core.jar). Copy/Paste or Drag & Drop the core.jar file into your Eclipse project (at the top level is fine). If you Copy/Paste, you may need to refresh your project before it shows up (Eclipse->File->Refresh). Next, right-click on the core.jar within Eclipse and select 'Build-Path'->'Add-to-Build-Path'. Note: You can also 'link' to jar files without copying them, but this can cause minor problems, especially on the Mac, so for new users I recommend the steps above. Now run your applet: Run > Run-As > Java Applet. If all went according to plan, you should see your sketch pop up in the 'applet viewer' window, and any errors or messages should go to the eclipse console. Remember to test any sketches in a browser before posting them to the web; just b/c something runs in eclipse, doesn't (necessarily) mean it will run in either Processing or a web-browser. Lastly, add an external file (a font or image or sound file) to your sketch and make sure you can load it in Eclipse. To do this, create a 'data' folder inside the 'src' directory (File -> New -> Folder) in your Eclipse project, then drag or copy your external file into that. Add the usual code to your sketch to load it and give it a try. Note: again you may need to 'refresh' after adding new files: 'Eclipse->File->Refresh'. NOTE: See this link if you want to run your program as an application in Eclipse. 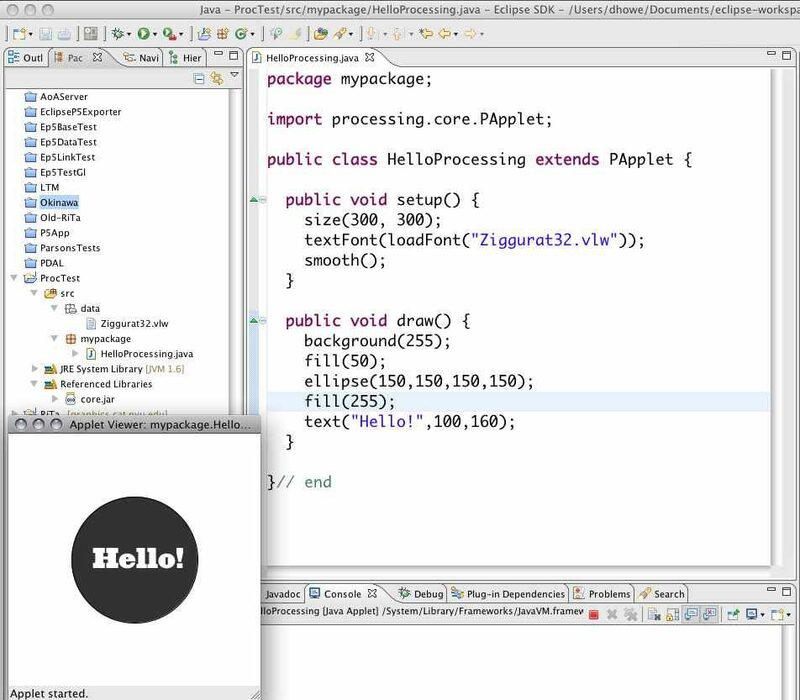 NOTE: See this link if you want to enable Processing-style exports from within Eclipse.